Below are ten moments that I captured on my lens during my visit to India. This is a very common practice in Tibetan Settlements in South India. You will also see it in Delhi's Majnu-Ka-Tilla. These water-filled bottles (or plastic bags) are hanged in the Patio (Verandah) to get rid of flies and other small flying bugs. Not sure about its effect but it surely rules the minds of Tibetans in exile. 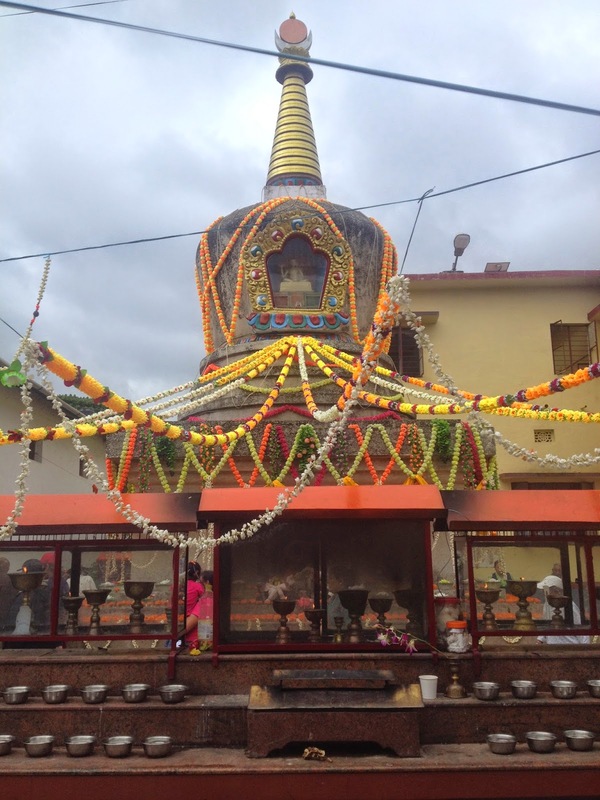 Myth or Fact: This stupa at camp 4 Bylakuppe is widely believed to be the Wish-Fulfilling-Stupa if you circumambulate 11,111 times. People from all corners come here to find cure for their ailing health, to seek approval for their visa application request, or to earn karma for the next birth. Buddhist devotees believe in the power of money. They don't even spare the religious idols by tugging money into their robes. 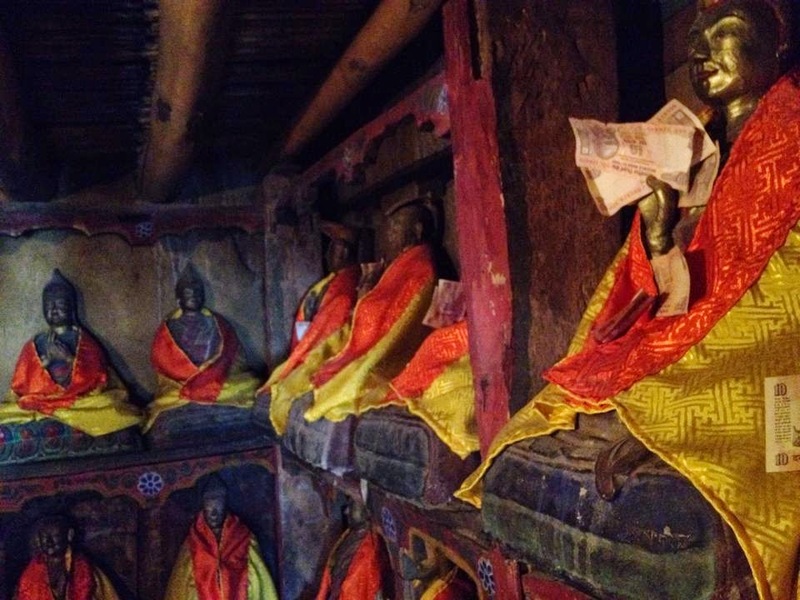 You will also see many devotees feeding money into the hands and feet of Buddhist idols. 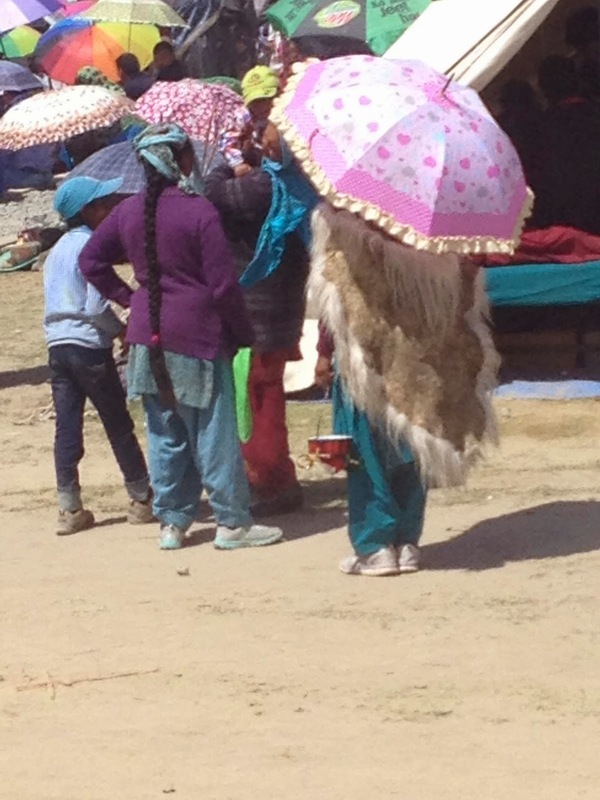 Not sure if she is feeling hot or cold in this hot summer of Leh, Ladakh. When I asked my parents the same, Dad responded, "this ra-pag (skin of goat) could be used as a cushion during the Kalachakra teachings and mattress during the night time". Ummm... Makes sense? In this beautiful birth place of Guru Padmasambhava, devotees feed hundreds of unharmed fish to earn good Karma. This is the place called Tso-Pema (in Tibetan) and Riwalsar (in Hindi). However, during my visit at the end of July 2014, I saw a plenty of dead fish floating every morning on the lake. Devotees were refrained from feeding for the next few days. I was perplexed at these number of dead fishes. After hearing from several people, there were two prevailing theories behind the death of the fish. The first one is not supported by the local Indians: That these deaths were caused by chemicals from the nearby Zoo which were washed down into the lake by the monsoon rains. 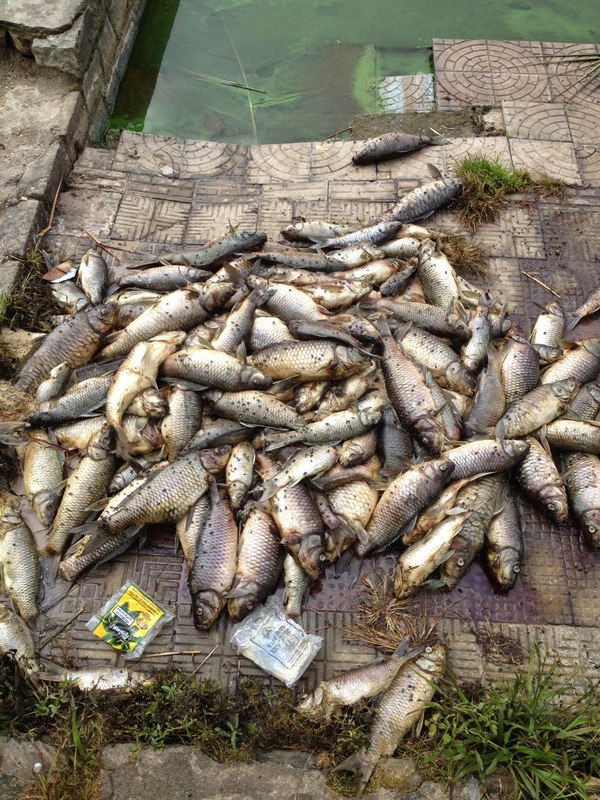 The second one is widely supported by the local Indians: That a Tibetan man came with several bags of Soybean (Sha-Zuma in Tibetan) and fed the fish - leading to their death (Picture below). Not sure which theory is true. But I definitely felt that the Act of Giving should be reasonable, sensible, and respectable. If the local Indians are to be believed, this Tibetan man might have thought of earning a plenty of good Karmas by feeding too many Soybean. However, the end result is what you see here in these pictures. An act of kindness has resulted in hundreds of deaths. 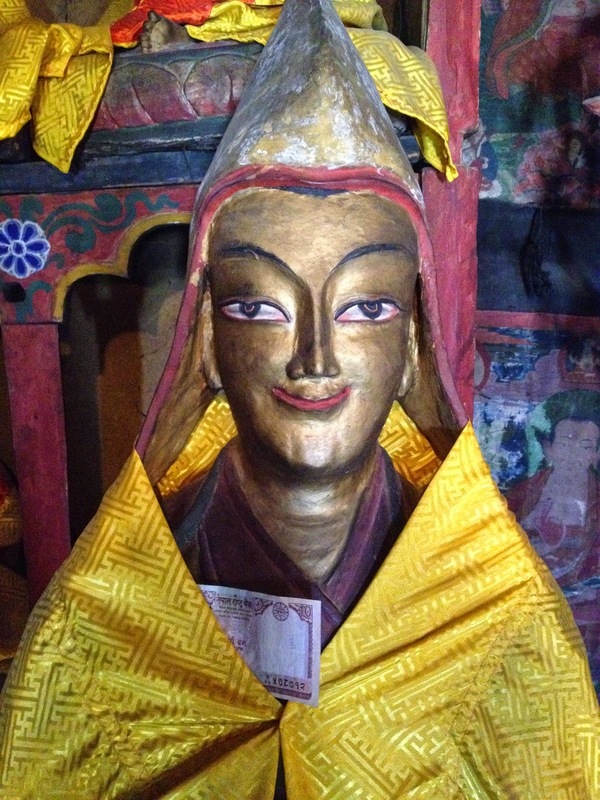 At the cave on the top of Tso-Pema, there were two large boards that says, "Please don't throw scarf on statue. Don't write anything on wall". But as you see there are names everywhere on the wall. Are names really important to disobey the words of Cave caretakers? Does writing names really make you more blessed than others? Why? Why? Why? This is an ancient prayer wheel made from the skin of goat/sheep. There is no short of creative people in India. However, there is a lack of respect for creative people in India. 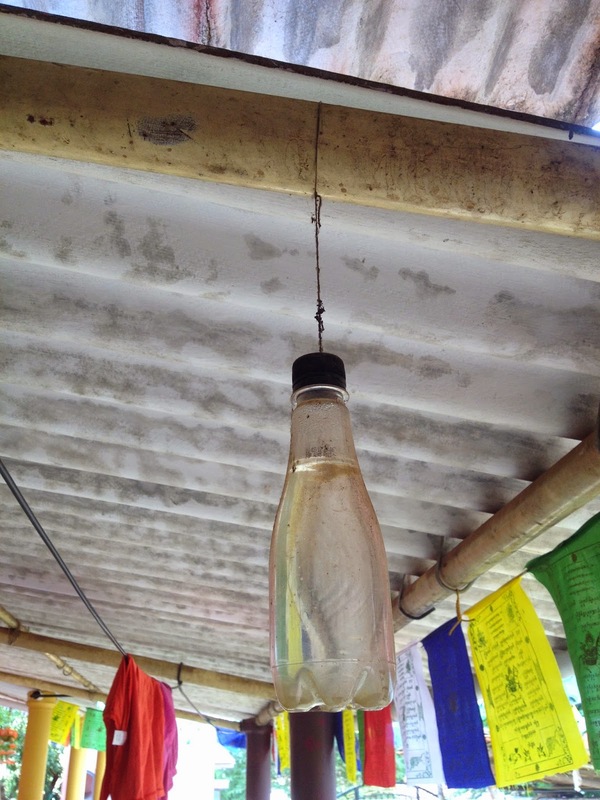 The picture below is a Prayer Wheel that rotates clockwise with the help of fans created by used plastic bottle. This is designed and created by a hermit living on the hills of Tso-Pema. This is a hand-held prayer wheel with wings attached to it. 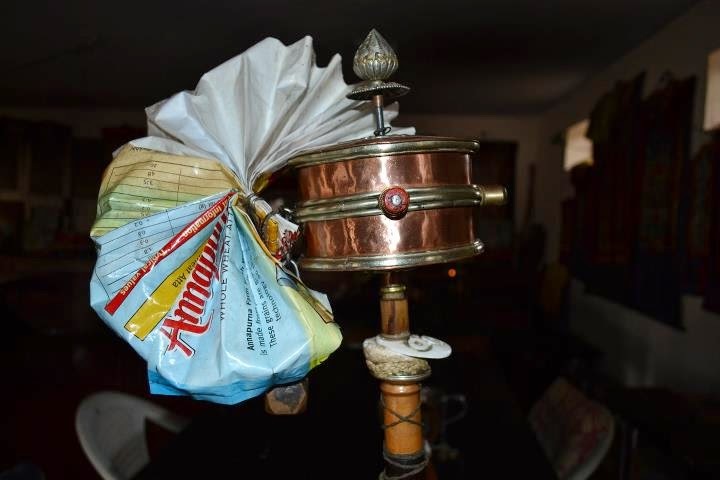 Since its hot in South India, this attached wing acts as a fan whenever he spins the prayer wheel. This is designed and created by an 80 year old who lives in Elder's Home. Finally, a moment to cherish. In India, the culture of respect for elders is always the Highest. You will see grand children supporting their grand parents at every corners of the country. Grand parents are not yet replaced by Google as it is in the most developed countries. Grand children ask their grand parents seeking answers on all of their questions. The one reason behind the increasing visibility of grand children-grand parent relationship could be the mobility of younger generations. Many educated young parent move to big cities or western world seeking a better future - leaving their children with their Dad or Mom. This article is based on few people and 80% is false !